The Elmbridge and Runnymede Talking Newspaper Association (EaRTN) is a free service providing recorded digests of local newspapers as well as other topics of interest on audio cassette for visually impaired people or those who are unable to read for themselves. EaRTN produces a Weekly News digest taken from the various editions of “Surrey Herald” and “News and Mail” groups of newspapers in Elmbridge and Runnymede; a Monthly Magazine which contains items of general interest rather than local news. Currently over 150 people receive EaRTN. The annual circulation of the 90-minute audiocassettes is more than 15,000. The Thames Valley Talking Newspaper (TVTN), as it then was, reached its first 35 listeners in the Weybridge and Byfleet area on 21st December 1975. 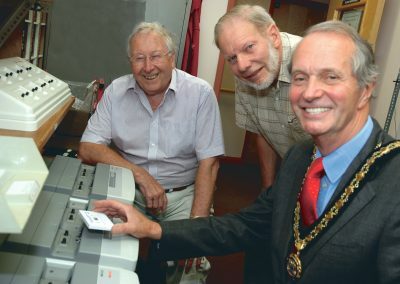 The early cassettes were edited and copied on Sunday mornings on a single machine in the home of Pat Cole, of Radio Wey, for more than two years. In June 1976 Walton Rotary joined the project, bringing 40 more listeners. TVTN grew in strength, with Esher Rotary joining in May 1977 and Chertsey Rotary following in 1987. 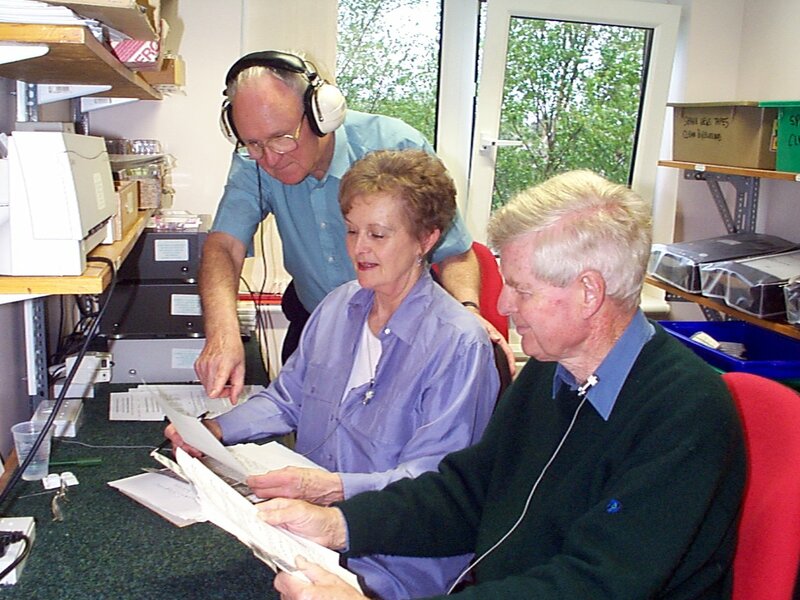 As word spread so TVTN increased its weekly circulation, and by the end of 1990 reached more than 200 blind and visually impaired people in the boroughs of Elmbridge and Runnymede. In 1995 it was decided to take over side one and speed up the weekly cycle, so that the news could be recorded on Thursdays, enabling listeners to receive their weekly cassette on Saturday rather than Tuesday the following week, as was inevitable under the arrangement at the time. 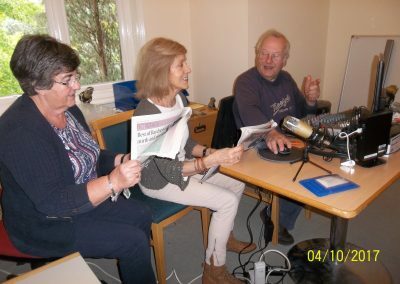 An appeal went out for volunteers to take on the much bigger task of editing, reading and recording the weekly news from the local newspapers. Following a feature article in the Surrey Herald, some 50 people answered the call and TVTN's own first news (on side two) reached its listeners by April 1997, though still alongside Radio Wey on side one. The re-launch was completed by November, when TVTN finally took responsibility for side one and the new, Saturday morning, weekly all-news cassette started – under the name of Elmbridge and Runnymede Talking Newspaper (EARTN). The magazine section became a separate monthly magazine, and was the sole responsibility of Heinz Vogel. EARTNs successful rebirth was recognised later that year when the Surrey Voluntary Association for the Blind voted it Surrey Talking Newspaper of the Year and the Runnymede Disability Liaison Group gave it their award for Services to the Disabled Egham, the last remaining Rotary Club in the two boroughs, joined EARTN in 1998 and the original magazine side was reinstated in the form of the EARTN Monthly Features Supplement, now better known as our Talking Magazine. In December 2004 the Talking Newspaper Association of the U.K awarded a certificate to EARTN in recognition of its 1500th edition. 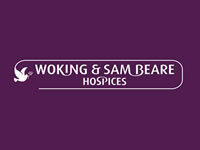 In 2005 the 30 th anniversary of its launch was marked with tributes from Michael Aspel, Bernard Cribbins, Nerys Hughes and the Mayors of Elmbridge and Runnymede. 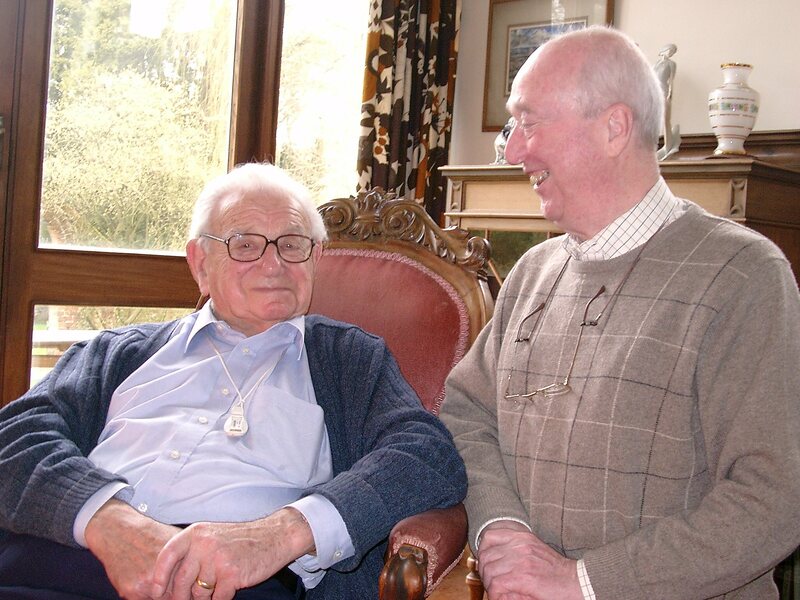 In October 2006 EARTN received £100 from the Glaxo Smith Kline Local Health Awards Scheme. Receiving this award was the retiring Chairman and Editor, Heinz Vogel, who was succeeded as Editor by Hugh Read, winner of one of the Elmbridge Community Awards for 2006 “In recognition of the voluntary support he has provided to the community”. 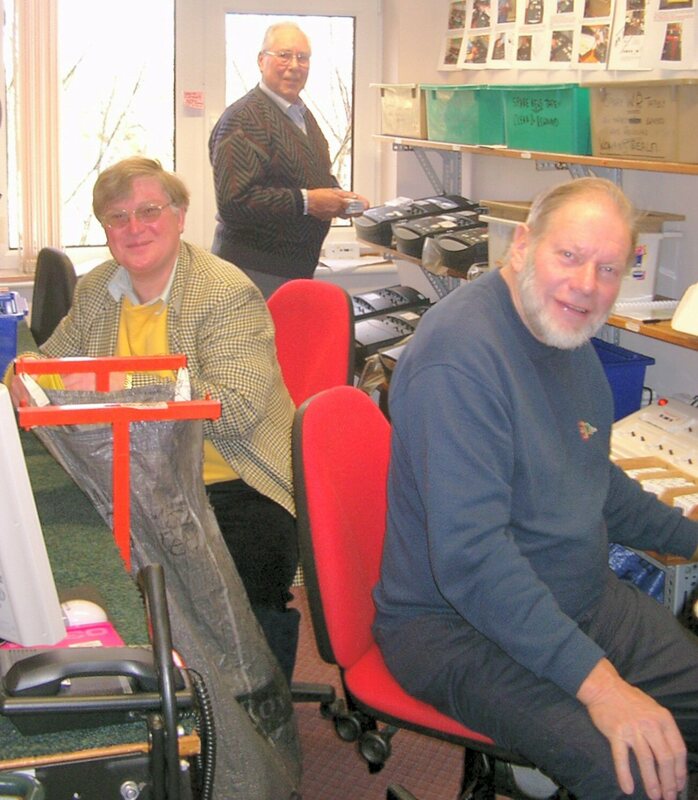 Faced with the failure of one of the machines used for cassette copying and the knowledge that the others would all need major repair, in February 2008 EARTN launched an appeal for £13,000 to replace the six copiers. The target was reached in April thanks to generous support from Elmbridge and Runnymede councils, local charities and the public, and the new machines were installed in May. 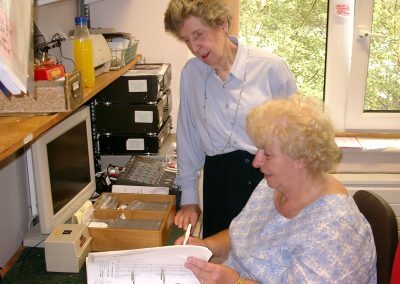 In October 2008, the work of the Elmbridge and Runnymede Talking News was again recognised, when volunteers Mary Cobham, Anne Prevost and Sid Stone were presented with Elmbridge Community Awards. 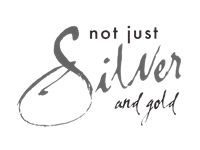 The Talking Newspaper was also recognized in 2013 by an award towards the running costs from Glaxo Smith Kline. Although the magazine ran successfully for 33 issues, it was too much for one person and was discontinued in November 2001. It was revived under the joint editorship of Hugh Read and Sid Stone, who produced it with a small team from the EARTN volunteers. The first edition of the new format was produced in February 2002, and in 2003 its success was recognised by the Runnymede Access Liaison Group with an award for Achievement and Contribution in enhancing the lives of disabled people. 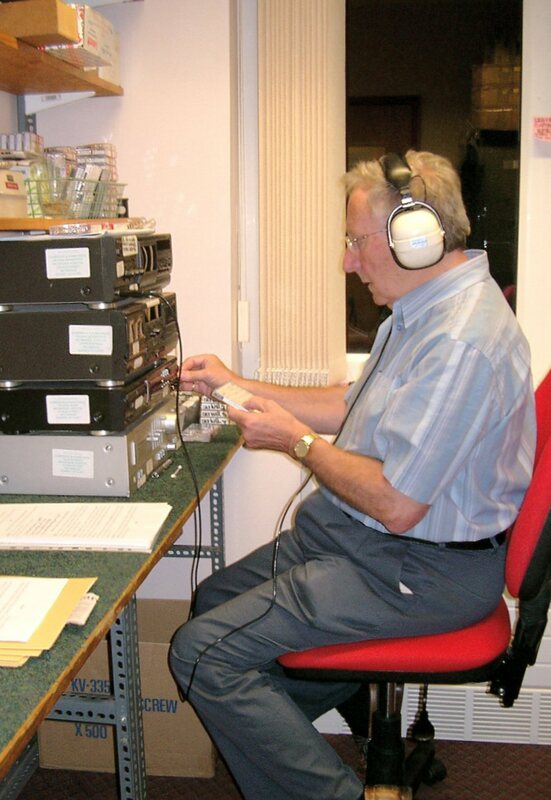 Due to a shortage of volunteers to continue production of the magazine, this service to listeners was suspended from January 2011, but was reinstated a year later with new editors. 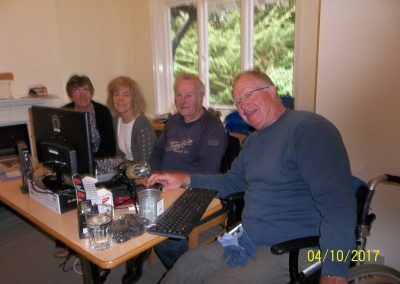 EARTN is now producing recordings at the rate of some 10,000 copies a year, reaching approximately 100 blind and visually impaired people in Elmbridge and Runnymede. These are recordings of the weekly news, which reached issue number 1,500 at the end of 2004, and the Monthly Magazine, which contains items of more general interest, such as interviews with local celebrities and items of specific interest to visually impaired people. The service is, and always has been, completely free of charge, as the source material is provided free by the Surrey Advertiser and Pollington’s newsagents. The Post Office collects the pouches on Friday evenings for free delivery and return for the listeners; General expenses are covered by the sponsoring Rotary Clubs. equipment to digital, the supply of players, or “Boom Boxes” to listeners and the purchase of flash drives. The new digital recordings were sent out in June 2013 and have been well received by listeners. 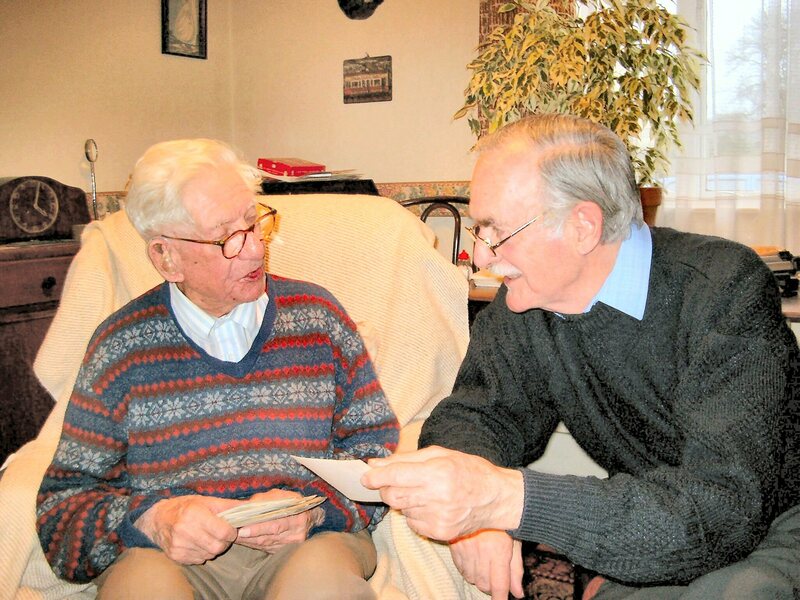 In October 2014, this Talking Newspaper was presented with the Bob Davis shield from Runnymede Access Liaison Group for services to disabled people in the Borough. The 2,000 th edition of the Talking Newspaper was sent to listeners on 28 th November 2014. That evening Mr. Mike Wood, Vice Chairman of the Talking Newspaper Federation presented a certificate of appreciation to our Chairman Chris Gilroy and Vice Chairman Jonathan Fisher. 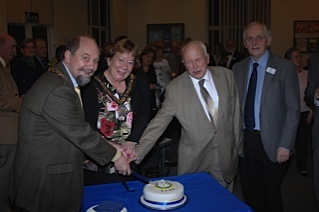 This Talking Newspaper celebrated its 40th anniversary in December 2015 and a “birthday” party in January 2016 was attended by the Mayors of Elmbridge and Runnymede and the Chairman of the Talking Newspaper Federation. 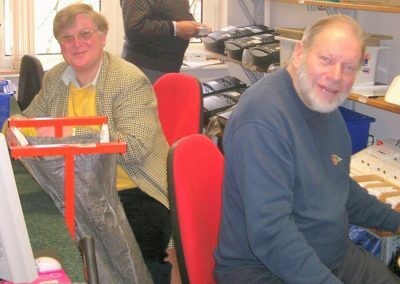 In July 2017, following the devastating fire at Weybridge Hospital, which had also housed Elmbridge and Runnymede’s studio, Runnymede Borough Council offered accommodation at the Orchard Centre in Chertsey and the new studio became operational in October of that year, thanks to the hard work of volunteers and donations toward the purchase of new equipment. If you would like to join our volunteers, or know someone who might like to receive our recordings, please ring our Helpline on 01784 435 622. MONDAY: The Movements Register Team records the address cards from returned pouches in the register. The following week’s despatch cards and pouches are then prepared and individual records updated as appropriate. TUESDAY: The Scriptwriter prepares the script in readiness for the next issue. When completed, two photocopies are made for the recording team, the original being used as the Recording Supervisor’s copy. WEDNESDAY and THURSDAY: The studio is used for recording, duplicating and other associated activities connected with the production of the weekly and monthly magazine recordings. FRIDAY (Morning): Cuttings from the Surrey Advertiser and Surrey Comet are combined with the scripts that have already been prepared for the Presenters. The Recording Supervisor and the two presenters (one male and one female) produce the master recording. After the session, the Recording Supervisor produces a back-up Copy Master, which will be ready for the copying team should the master fail or be otherwise damaged. (Afternoon): The Copying Team, consisting of two or three volunteers, produces the required number of recordings of the weekly News and the monthly magazine. These are inserted into the addressed pouches and put in mailbags for collection by the Post Office, who aim to deliver the pouches to listeners by first post on Saturday. Association amounts to a grand total of approximately 10,000 recordings a year. The Elmbridge and Runnymede Talking News (EaRTN) monthly Talking Magazine, unlike the weekly news digest that requires a disciplined weekly structure to ensure its regular production, can be produced in a rather more relaxed manner, in line with its publication date of the first week-end in the month, although it still requires a disciplined and organised approach to its preparation. Thus the editorial team, lead by the joint Editors, plan the contents well in advance, leaving space for the more topical items and aim to have the recording made at least 10 days before publication. This leave time for reflection and ‘fine tuning’ at the last moment. The monthly Talking Magazine contains a mixture of original articles, interviews with interesting / eminent people in the area and readings of stories of general interest . 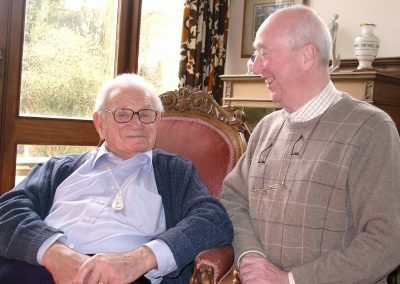 Recent interviews recorded include a series of reminiscences by one of our oldest listeners, Ernie Russon, about his experiences in service during the 1920s and ‘30s; Michael Aspell, currently of the BBC Antiques Roadshow fame; Sir Nicholas Winton, who was instrumental is saving some 700 children from the holocaust in 1939; various actors and actresses from TV and the silver screen, and even memoirs of some of our own volunteers. Thus, there is always room for contributions from individual volunteers who either have a story of their own to tell or who are prepared to conduct interviews with interesting people. 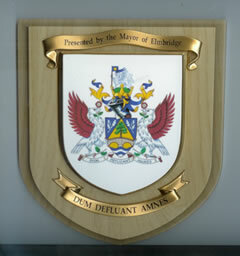 On Wednesday, 29th April 09, the Worshipful Mayor of Elmbridge, Cllr. 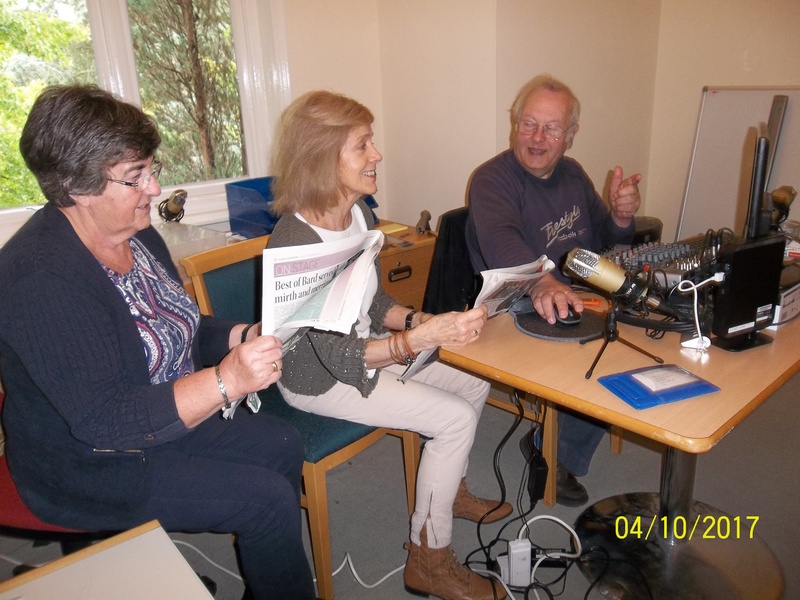 Nigel Cooper, visited the studio of Elmbridge and Runnymede Talking Newspaper to record an interview with volunteers Anne Prevost and Sid Stone, during which he reviewed his year of office and spoke movingly about the highlights. He had met four members of the Royal family (the Earl and Countess of Essex, the Duke of Kent and the Duchess of Gloucester) and the members of the British Olympic rowing team. He felt he would remember for many years meeting an old lady who was celebrating her hundredth birthday. He helped her to cut her birthday cake, but was particularly touched by the way she continued to hold his hand throughout. The Mayor then presented a special award to the Talking Newspaper – a limited edition plaque. EaRTN welcomes volunteers to help with the production of the tapes. 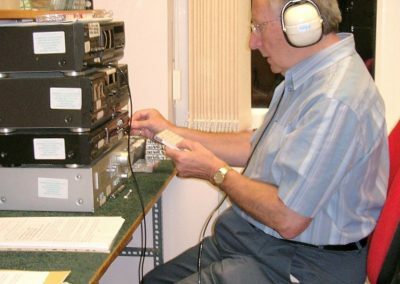 Due to the retirement of some long serving volunteers, the EARTN urgently needs help in order to produce the cassettes of local news for visually impaired people in the two boroughs. 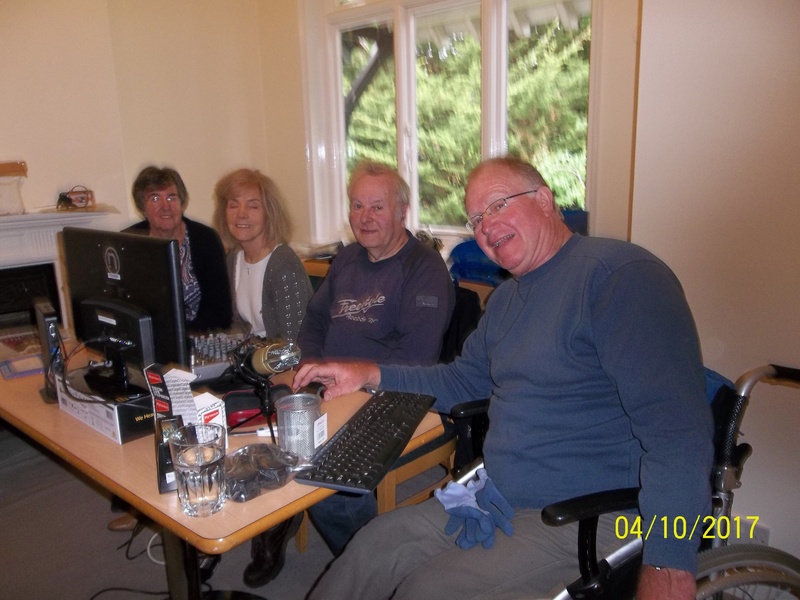 The team of volunteers prepares a weekly digest of news from the local newspapers as well as a monthly magazine edition of interviews with local celebrities and items of interest to visually impaired people. The service is free and the tapes are collected from the studio on Fridays for delivery by the Post Office at the weekend. Duties usually involve two to three hours every four to six weeks. There is something going on every morning of the week, so if you can spare a weekday morning to join the team, please ring our helpline on 01784 435 622.